Ciaran Mc Hugh from rescue 115. 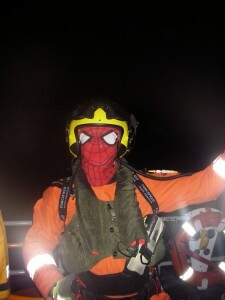 ‘Spiderman’ was Ciaran Mc Hugh from the Shannon based Coastguard Rescue Helicopter. He was lowered from the new Sikorsky S-92 helicopter to the deck of our new Tamar class lifeboat, during a night training exercise. The S-92 will take over duties from the much older Sikorsky based at Shannon in a couple of months. Best of Luck to all of the Rescue 115 crew with their new flying machine.